In Manhattan, a circle of wealthy young socialites party, gossip and generally congratulate themselves while the self-styled intellectual Tom (Edward Clements) reluctantly joins the group. Riffing on Noel Coward and Woody Allen, and prefiguring the preppy urban cinema of Noah Baumbach, Whit Stillman’s directorial debut is a terrifically satirical portrayal of the upper echelons of New York society. Metropolitan opens with Tom on his way home from a ball, but is strong-armed into attending a party with some casual, very privileged associates. Explaining to them that he is a socialist and thus against high-flown soirees such as this one, the group adopt him as a harmless curiosity, taken in hand by the priggishly-confident Nick (Chris Eigeman). The bookish Audrey (Carolyn Farina) quickly develops an unrequited crush on Tom – sticking out as he does among his more obviously self-aggrandising peers. But his own brand of pseudo-intellectualism is only marginally deeper than that of Nick and his friends. True to much of the American indie scene of the 1990s, plot takes a back seat to mood and character. Much of the action is confined to the warm, dark interiors of the group’s wood-panelled apartments, with measured compositions and largely static, close up shots. These are contrasted with the occasional exterior sequences where the group wander from one party to the next. The camera suddenly pulls back and moves with the group, as if able to breathe outside the confines of their quasi-incestuous society. The sound design, too, speaks to the era’s aesthetic, with the ambient sound of the city dominating and dialogue recorded without the benefit of ADR. It’s a wonderful aesthetic confluence borne from necessity over design. The laconic way that the group make their way through debuttante season and the Christmas holidays is almost Linklater-esque in its laid back feel, differing only in its class affectations. Indeed, for a group of jumped-up over-priveleged prep kids – Tom included – the group are remarkably relatable as 20-somethings who haven’t quite discovered themselves, not least because of their chronic lack of self-awareness. Tom is really the key here: lamenting the pretensions and trappings of the bourgeoisie, he rejects parties (while attending quite a number of them), and with affected authenticity chooses to use public transport over cabs. Meanwhile, he’s still hung up on a college girlfriend who obviously couldn’t give two figs about him, while the most genuine, kindest person in his life pines for him unnoticed. In the best line in an already witty script, Tom painstakingly explains to Audrey that the works of Jane Austen are singularly dreadful. Pushing him on this, Tom extrapolates that he is a fan of American literary critic Lionel Trilling, who also despises Austen. It transpires, without a hint of irony from Tom, that he hasn’t actually read Austen, because the critics can do that for you. Pithily summarising his position, “you don’t need to read books to have opinions on them”. 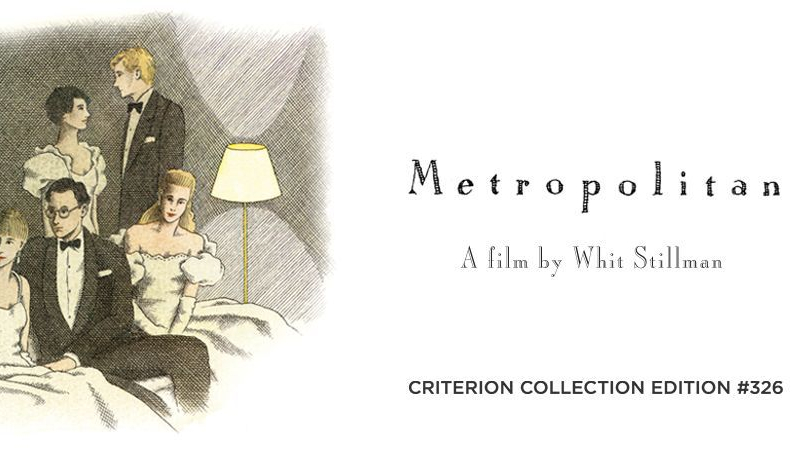 The social satire of Metropolitan is more gently mocking than damning. The result is that Stillman’s film is ineffably charming, witty and not a little melancholy in its observation of youth’s capacity for pretension and self-deception.